I’m trying to integrate the data from a Robonect (https://www.robonect-shop.de/) module installed inside my automower. the Robonect has an MQTT interface. 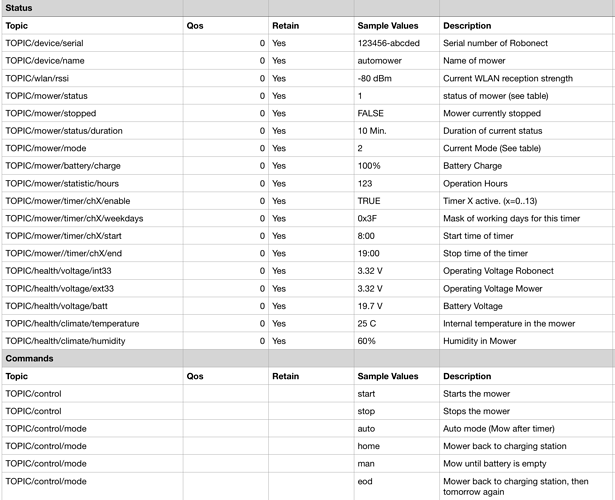 I’m trying to figure out how to use the values which are not json in HA via the MQTT vacuum component. looking for any advice I can get. here is a chart of the MQTT values for robonect. Hi, do you made some process on this? I ordered today a robonect mobul and it would be glorious to have this in my home assistant hub, too. I ended up just setting things up as MQTT sensors, with an input select to drive an automation that sends the commands. name: "mower_name time in current status"
name: "mower_name Operating Voltage Robonect"
name: "mower_name Operating Voltage Mower"
Thanks for your work. Please can you tell me what do I need to put in MQTT-Client in automower? In HA I got message “Unable to find component mower_name_command”. I copy/pase all from your configuration (I did not change anything). What do you think it could be? thanks, you are right I missed “input_select:”! Now I can see Robonect in HA but when I try to sent commands from HA to robonect nothing happens (HA says :“Service input_select/select_option called.”). 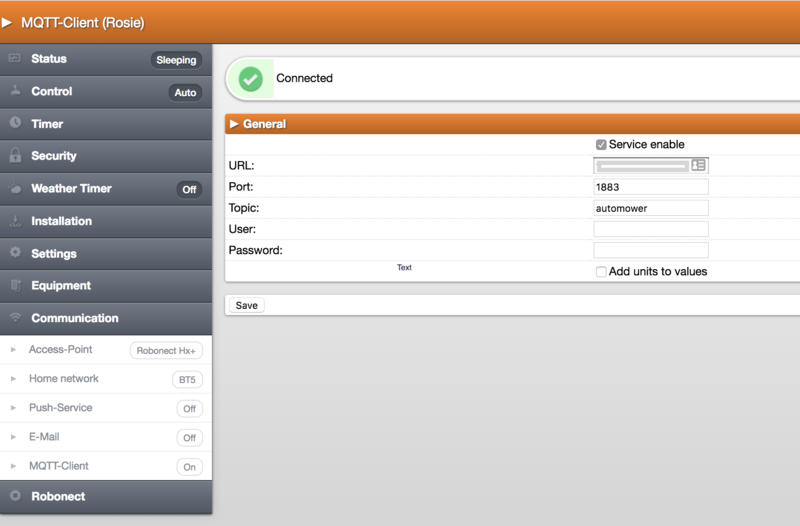 In robbonect status of MQTT-Client is connected. did you set up the automations that publish the commands to the mower? as as side not I just had to pull my robonect out of my automower because I got an email from the robonect supplier advising to stop using immediately, due to a possible short circuits due the manufacturing process. they are sending out replacement parts in about 14 days. I bought a Robonect® Hx modules with a 20p adapter in June of this year. I think it’s the 20p adaptor that has the issue. Problem was in copy/paste configuration from last post in configuration.yaml because I mixed config from tube0013 and config from JLeandroFreitas (he use “- status _quo” insted only “- _”.